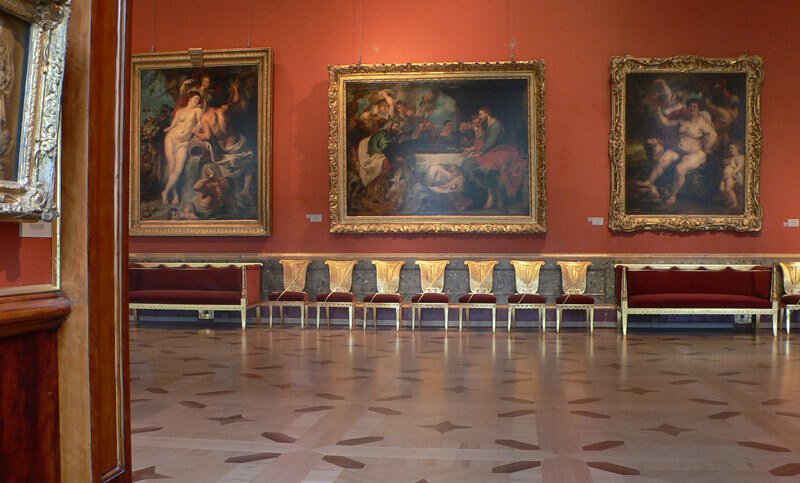 Hermitage Museum St. Petersburg is one of the largest and fascinating museums in the world. It has exhibitional halls in Russian cities and abroad. Just being in St. Petersburg you can be surprised by the number of museums which belong to the State Hermitage in this particular city! Let’s talk about the options for your Hermitage tours in St. Petersburg, Russia: which buildings belong to the museum and what to see there. Five interlinked buildings of the State Hermitage became the best-known part of the Museum. Who hasn’t heard of the Winter Palace? Definitely everyone has had! You will see the Winter Palace on your Hermitage tours along with three other buildings: the Small Hermitage, the Old Hermitage and the New Hermitage. The fifth one is an active theatre, which works at night: the guests can admire an opera or ballet in the cozy former private theatre ofthe Romanovs (Russia’s second tsarist dynasty). For more detailed overview, please, see our article “The Hermitage Museum”. World-famous Scythian gold and the works of the best goldsmiths and jewelers are waiting for you in the museum-storages and they require a separate ticket or booking: the Diamond Room (Treasure Gallery 1) and the Gold Room (Treasure Gallery 2). The Winter Palace which belonged to Peter the Great is not the one everyone knows. Frankly speaking, there were several “winter palaces”: they were used by the Royalty during long Russian winters. Peter’s one was preserved by the succeeding Rulers and is located on the ground floor of the Hermitage Theatre. Half of the building of the Imperial Army Headquarters belongs to the State Hermitage Museum, while the other one is still used by the military. This magnificent building is opposite the Winter Palace and completes the ensemble of the main square of St. Petersburg – the Palace Square. General Staff of the Army building was recently reconstructed. At the moment it is used for temporary exhibitions and houses one of the world’s best collections of Impressionist and Post-Impressionists moved there in December, 2014. So, please, be prepared to find no Monet or Renoir or others in the Winter Palace: if you wish to see this art on your Hermitage tours you should purchase a separate ticket or a combined one for the main complex and General Staff affiliate. Besides, it is a good idea to inform your guide about your wish to see this collection in advance. The option to combine both visits on one day requires mush more time and that should be reflected on your itinerary for the day in the Hermitage Museum, St. Petersburg. The Menshikov Palace is one of the oldest gala residences in St. Petersburg. It belonged to a man with an exceptional fate. Alexander Menshikov was born in a simple family, but managed to get to the very top of the Russian Empire. He became the first Governor-General of the capital of the time – St. Petersburg – and the “right hand” of Tsar Peter. Of course, there was a matter of luck in this life story: being boys of the same age Tsarevich Peter and Alexander Menshikov got acquainted and played games together, they got along very well, and the friendship lasted through almost all their life: Peter the Great finally discovered the great thieves from the state, he couldn’t stand the betrayal of the person he trusted so much. The Menshikov Palace St. Petersburg keeps the touch of Peter the Great’s epoch and reminds of the ambitious owner Menshikov who learnt all about the peak success and failure, who tried to surpass the Tsar in luxury and put his daughter on the Russian throne after Peter’s death. The Palace witnessed many important receptions of Peter’s time, as the Tsar’s chambers were way more modest than of his friend Alexander Menshikov. The Repository is a scientific-research centre, storage and museum – all in one. A beautiful collection of furniture, Russian paintings, and imperial carriages is waiting for you along with the secrets how they store the exhibits and what discoveries are being done by the museum workers now. The Repository of the State Hermitage Museum is situated in the district of Staraya Derevnya, it takes about 30-40 minutes to get there from the city centre if no traffic. Let’s discover the Hermitage St. Petersburg together: our fully licensed and professional tour guide will make this excursion memorable and exciting. We will beat the crowds!